Guzmania are perennial flowering plants in the bromeliad family that are related to the pineapple. Most commonly grown in containers or flower planters, they thrive as indoor plants when environmental needs are met and will perform well outdoors as a garden plant in warm or temperate climates. Site the plant in dappled shade or bright, indirect light in a location protected from winds and temperature fluctuations. Guzmania flowers each year in summer with its bloom lasting several months. Plant your Guzmania in a quality commercial potting soil that is coarse in texture and will easily drain. Look for an orchid mix or a potting soil containing wood chips and perlite. Select a planting container that is roughly the size of your Guzmania's root ball with just an inch or two of extra space. It performs better in a smaller pot with less soil to potentially rot the roots. Choose a pot heavy and stable enough to hold the plant upright but no larger. Make sure your container has a number of small drainage holes to allow excess water to escape. Water your Guzmania deeply every two weeks, drenching the pot and then allowing the soil to completely dry before watering deeply again. 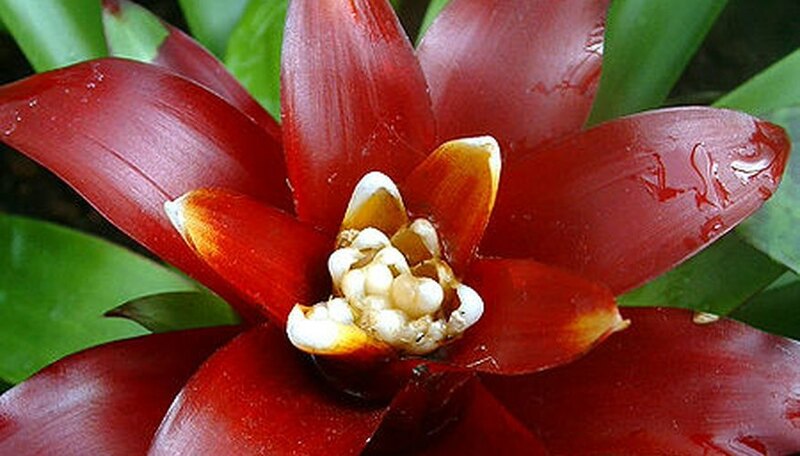 Guzmania plants have a hollow in the center rosette of the plant that is designed to hold a fresh water supply for the plant to draw upon as needed. These are referred to as tank bromeliads. Water the plant over this rosette to rinse out and refill their tanks with fresh water. Do not allow the tank reserve to dry up between full waterings. Feed your guzmania with a water soluble, general purpose indoor plant fertilizer every month over wet soil after regular maintenance watering. Guzmania are not heavy feeders, so dilute the fertilizer to one-quarter strength of the recommended dose to prevent over fertilization and the build up of mineral salts in the soil. Prune your guzmania flower after it fades by cutting it off at the base of the flower stalk. Most guzmania only bloom once and then die, but they produce offshoot plants called pups. You can leave the pups in place to grow or you can cut them off of the main plant and pot them individually. This will begin the growth cycle and they should reach maturity and bloom in two to three years.